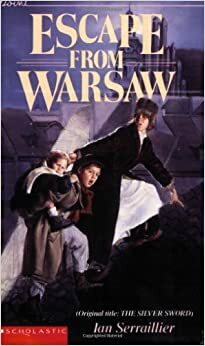 Without perseverance, initiative, leadership and problem solving skills, the Balicki children depicted in Serrailliers’s true World War II story wouldn’t have survived to escape from Warsaw. Like many families of that era, the children had become separated from their parents and are forced to call upon their own skills and the kindness of strangers in an attempt to reunite with their parents. Joseph Balicki, the father of Ruth, Bronia and Edek had escaped from a concentration camp and returned to Warsaw frantically searching for his children. There he befriended a young man named Jan, who promised to look out for his children while Joseph made his way to Switzerland to reunite with his wife. Jan was a very clever youth who had developed exceptional survival techniques. Shortly after Joseph Balicki leaves Warsaw, Jan meets the Balicki children. Bronia, the youngest child grew during the story to have a pronounced personality while speaking her mind. Edek was the middle child who was genuinely creative with his hands, and built a shelter for the family when they were traveling. Ruth, the oldest child taught stray children who were just trying to survive, how to read and write. Although Jan’s background remained a mystery throughout the book, I enjoyed imagining his past and conjuring his future. I loved the suspense throughout the story because Serraillier left a few loose ends at the end of each chapter. Serraillier’s way of incorporating WWII history into an engaging story full of mystery and bravery was a cunning way to inform teens about what happened before their era. I found it fascinating to consider how people like these characters survived during WWII. The inspiring characters in the book made me want to hurry to the conclusion of the book to find out if the family was reunited.